My basil is gorgeous this year, and over time I've learned a few tricks to keep it growing and looking lush. 1) I keep it covered in the garden with row covering that keeps bugs out and lets sunshine and rain in. 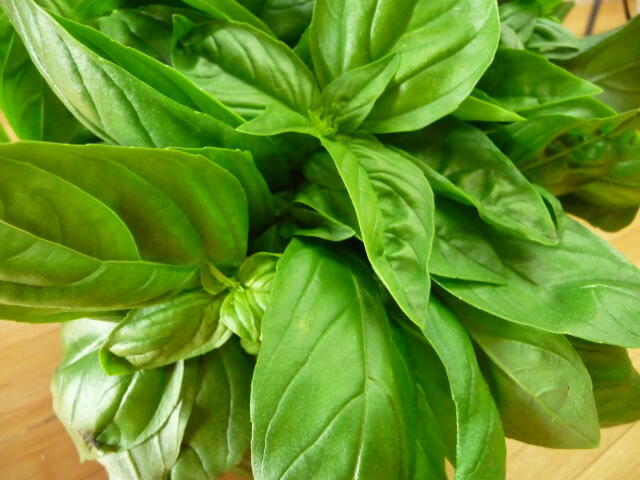 4) Never keep basil in the refrigerator; it hates cold and the leaves will wilt. 6) If you have a lot of basil, make pesto now and freeze it for future use. I freeze pesto right in glass jars. Pesto’s slightly peppery flavor marries well with many foods including fresh cooked corn. So step out of the traditional butter and salt flavoring for summer corn and give pesto a try. Use half of the prepared recipe below to dress a dozen ears of corn. Left over pesto can be refrigerated for future use. Place the pine nuts, garlic, cheese, and coarse salt in the bowl of a food processor and pulse two or three times. Add the basil leaves and pulse two times. With the motor running, pour the olive oil a little at a time through the feed tube and continue processing until a smooth sauce consistency is obtained. You may not need all the oil. Transfer to a jar. For a dozen ears of corn, heat 1 cup of pesto sauce in a small saucepan. Brush cooked ears with pesto. Serve. Thank you Lidia this is amazing information you always are so inspiring with your posts! Oops i meant Mary Ann ! Sorry. Thank you Maryanne! Great tips and recipes, as always! when is the cheese added in recipe ? CAN YOU TELL ME HOW TO CUT THE BASIL OFF THE PLANT? SHOULD IT BE FROM THE TOP OR CUT LEAVES FROM THE BOTTOM? MY PLANT IS A SINGLE PLANT. ALSO, WHEN THE SEEDS START COMING OUT, SHOULD I CUT THEM OFF AND LET THEM DRY TO REPLANT? THANK YOU! I also have an abundance of basil so I have come up with another idea for storage. Every few weeks, when the plant is full, I give it a haircut. I take all the branches in and strip the leaves. Rinse and dry well. Then I put them in a ziplock bag with a little bit of air still in the bag. Freeze. When I cook I will take one or two leaves out of the bag. The flavor is exactly the same an I still have control over how much basil I use instead of just shaking a dried herb into the pan. I love your recipe for pesto! I make it quite often for my grandson. Paul Lally and Rose Moore have given me some tips on how to grow it. Not to change the subject,, but I miss seeing you on television/ I keep writing to the programming dept. Jaymie and she says it MAY be back on in October. I CAN'T WAIT!!!!!! How long can you keep the pesto in the refrigerator? After few days my pesto gets brownish. I have tried everything. What's causing it? Thank you for the tips for basil. I thought I knew what to do since I come from an Italian family that are very good cooks but you taught me some things. Also thanks for all the wonderful recipes. They are like my Grandmom's . :) She use to make a home made bread that had fat back in it was wonder if you know a recipe for it please send it to me. I believe this tip came from Mary Ann several years ago. we wrap enough for a recipe in a piece of paper towel and put each packet in a zip lock bag until it's full, zip it shut and put it in the freezer. another way we did it was to take the leaves and freeze them in ice cube trays.